No, I haven't been watching the night skies looking for ET (although I did once see a Min-Min Light - but that's another story!!) My one New Year's Resolution, besides resolving NOT to make New Years resolutions, was to work on finishing some of my craft UFO's - and they are legion!!! I'm pretty sure most crafters are the same, you're part way through a project and some particularly gorgeous fabric catches your eye and you just HAVE to start a new project using it. Or, in my and a lot of designers' case, you have an idea for a new pattern design and have to make the prototype RIGHT NOW to see how it will look. As a result, there's a pile of partly completed projects piling up in the sewing room cupboard. So, my plan this year is to set one day a week aside to work on UFO's. I plan to work my way steadily through them so that by the end of the year, I should have lots of lovely, newly completed quilts/dolls/bears/wall hangings (I think you're starting to get the picture!!) and of course, I'll have lots more wonderful storage space in my sewing cupboards, ready to fill with new fabric that just seems to follow me home! Tee! Hee! Hee! The first of my UFO's that I'm tackling (yes, I have at least started the year well!) is a red and green quilt to go on the back of the couch in the lounge room. At the moment, the couch is adorned by the very first quilt I ever finished. I used synthetic wadding (I was living in Bourke at the time and it was the only wadding available, plus I didn't know any better then!) and having done no quilting classes, I made up the procedure as I went along. Taking all of that into consideration, it didn't come out too badly, but that was about 12 years ago and it's now looking a little sad. Since the lounge room is painted a fresh light apple green with white trim and red accents, I thought a red and green quilt would go perfectly - and I just love the combination of red and green, particularly the shabby chic tones, which this quilt picks up. Of course, I've had lots of people comment that it must be a Christmas quilt - I've given up explaining and just say, "No, I like red and green all year round!" So ... so far, I've finished the stitchery panels for the centre, sewn on the stripped borders of said stitcheries, joined them together (I'm making it a 'quilt as you go' quilt or it would NEVER get finished! 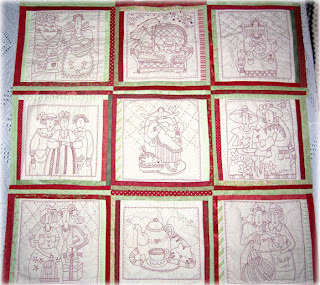 ), put the first thin border on and am in the process of sewing lots of squares together for a patchwork border. I thought I'd share some of my progress to date. Here are all the centre stitchery panels joined together. 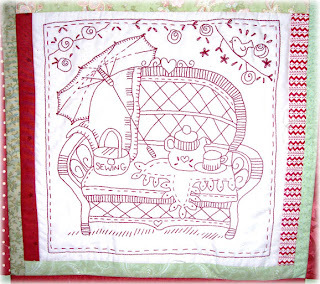 I've used Red Brolly/Bronwyn Hayes designs, as I love her style. This is probably my favourite block, for a few reasons. Firstly, it was the last one I finished, so there was a wonderful sense of accomplishment, as it had taken about 12 months to complete the stitcheries. They were 'in between' projects when I had completed one pattern design and hadn't begun the next. Secondly, the title of this design is "My Sewing Chair" and it is my long held dream to one day have a little nook in a lush cottage garden with a cane chair in the shade to sit and stitch. Sigh!!! One day! In the meantime, I'll enjoy the dream as I look at my quilt. And I'll keep you posted on the work in progress. I realise that it won't always be possible to set aside a day to work on my UFO's, but if I have that as my goal, even if it's only half an hour or so, surely I should achieve SOMETHING for the year! No, I'm not late for last Christmas or early for this year's Christmas celebrations, for that matter. 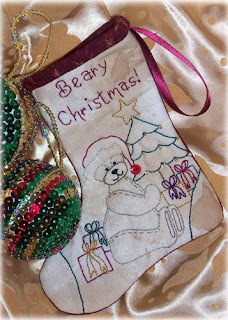 "Beary Christmas" is the message stiched on my latest design, which I finished today. Yay! It's always great to completely finish a new design - instructions, photo, EVERYTHING! - and be able to add it to the web site. Of course, it's always a little nerve-wracking too. Will people like it? Will anyone buy if? However, I'm very pleased with how this pattern came out. I actually came up with the design when I signed up to be part of Kerryanne English's Christmas Ornament Exchange through Woodberry Designs . I sent my partner, Joy, a little stocking like this one - but couldn't take a photo, as the camera was MIA!! Frustration! However, I've now made two more - to show the two variations - and took photos for the pattern this morning. Here it is. What do you think? The finished stocking is just 6" long, so it's perfect for a tree ornament, or you can make it as a pocket stocking and pop small gifts into it - because everone knows that the best things come in small packages!! I've also been working on a design for my first applique` quilt. Well, not the first I've made, but the first I'll offer as a pattern. 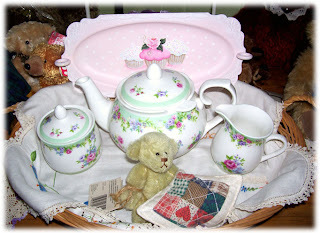 It features two of my favourite things - teddy bears and tea cups. 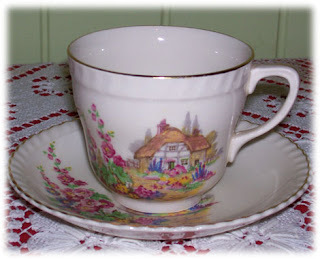 And speaking of tea cups, I thought I'd share a couple of photos of some of my favourites from my growing collection. 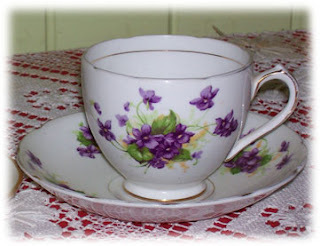 This is one of my favourite cup and saucer sets from my Nan's collection. I love most china featuring violets. I think it's the deep purple and green working together that draw my eye. This was another antique shop find - unfortunately it didn't have the matching plate, but the hand-painted cottage was so cute I had to bring it home. One day I'd like my garden to have the overgrown cottage look. With Toowoomba on some of the strictest water restrictions in Australia, I don't think that will happen any time soon!! Two of my very favourite things! And today I received a lovely surprise in the mail when a folk art platter painted by my favourite folk artist, Kerryanne English of Woodberry Designs, arrived. Kerryanne put a number of items for sale on her web site on Saturday morning, and, since I'd been eagerly waiting for her to do so, I quickly snapped up the platter featuring the sweet cupcakes. I think lots of people had a similar idea, because almost all of Kerryanne's offerings sold within a couple of hours! Wow! Lots of people with great shabby chic taste! I'm not usually a pink person, in fact, I describe my self as 'the anti-pink' but have come to appreciate some shades of it when it's teamed with apple and mint greens or cupcakes. I also love Kerryanne's range of faux cup cakes, but I always run out of play money before I order some. One day ... 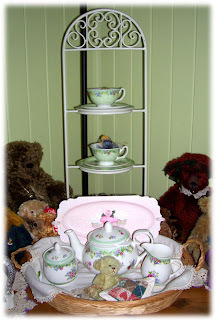 In the meantime, here's a photo of my lovely cupcake tray amidst the tea cups and bears! My brand new tray is now at home amongst some china tea cups from my ever growing collection, which began with some crazy tea set trios that belonged to my Nan. When Nan passed away, Mum rescued a small portion of her crazy tea set and put it away for me. 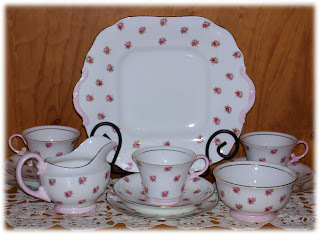 It now has pride of place on some shelves in the dining room and has expanded a little to include pretty sets that I find when Scott isn't quick enough to keep me out of antique stores! Tee! Hee! Hee! Whenever I enjoy the kaleidoscope of their pretty colours, I think of my Nan. We used to laugh at her because she couldn't go more than a couple of hours at a time without saying, "I just need a sit down and a nice cup of tea!" Now I find myself saying the same thing - often! In fact ... I think I might pop out and put the kettle on to boil right now! Well, maybe not quite walking on sunshine, but definitely enjoying a sunny day for the first time in ages! Toowoomba has had maybe three or four sunny days since Christmas and I'm starting to feel a bit like a mushroom!! So, today's mostly blue sky with genuine sunshine was wonderful. I spent today at The Quilter's Angel in Highfields sewing with Mary, Deb and the girls from Fresh Hope - lots of laughs, lots of new friends and some frustration with sewing machines that weren't feeling co-operative. Most of the girls had very little or no sewing experience, so the learning curve was steep, but the end results were pretty good. After sewing some fluffy seatbelt protectors for the kids, the girls began their new project, a cool quilted bag with a stitchery panel on the front. Can't wait to see the finished products, as the girls are already starting to put their own little touches to them. I love a class situation where everyone starts with the same basic pattern, but the finished projects all end up unique. Will keep you posted. For experienced bloggers, this may seem a little silly, but since I'm still wearing my "L" plates when it comes to many things web and computer related, as Neil Armstrong said this is indeed a "huge step" for me to take! You see, I usually turn to my trusty sidekick "Geek Boy" (AKA my long-suffering, far-too-clever-for-his-own-good, computer-genius husband Scott!) to handle the technological advancements for my litle corner of the world. He obviously took a passing comment a little too personally, though, which has left me in the drivers' seat. You see, it all began when my mate Mary from Fresh Hope Patterns (http://www.freshhopepatterns.com.au/) asked whether I thought we should add a blog to the FH Patterns web site. I, in turn, consulted my handy computer expert who said he'd do a little bit of research for me. (Note: "Geek Boy" is never happier than when researching some new computer-related subject, so little encouragement was really needed!!) During said research, he showed me a test sentence he'd typed, to which I replied, "So, if we go with a Blog, I'll be doing the writing, hey?" Me and my big mouth! So, I do hope you'll all bear with me (no pun intended, considering my business name and main design focus!) as I learn my way around this new mysterious 'blogging' thing. Not sure how I'll go, as I've never even been able to keep a diary for more than a few days, but I'll give it a shot. Hopefully, I'll provide you with a few giggles at my exploits along the way as you get to know me a little more and hear about what's happening at the home of Tag Along Teddies. Hmmm, it suddenly occurs to me that I should introduce myself a little for those who haven't yet met me through my web site (http://www.tagalongteddies.com/). My name is Kris Meares and I operate a craft design business called Tag Along Teddies - because the bears just want to 'tag along' home with you! My craft career began at the tender age of three when my Mum showed me how to hand stitch two pieces of fabric together and stuff them to make a pin cushion. In hindsight, I believe this was a clever ploy on her part to keep me busy so she could undertake the dressmaking she wanted to finish!! Little did she realise where that first creative foray would end up! All through school, I drove Mum and the school librarian mad in my extensive search for craft 'how to' books and the materials needed to make the featured projects. I later dabbled in a wide and varied array of crafts including: card making, fabric-covered frames and albums, pottery, screen printing, silk painting, spinning (I still have the lovely little Thumbelina spinning wheel! ), knitting, crochet (had to do something with all that spun wool! ), applique`, patchwork, quilting, embroidery, folk art, cloth doll making and bear making. My mother, who actually began this journey for me, now shakes her head in bewilderment!!! Tee! Hee! Hee! While I still dabble in a number of these crafts, some have been tried and set aside. My main focus these days is on bears - of all shapes and sizes. I learned to make heirloom mohair bears in a class taught by a friend of a friend and have been hooked ever since. For a while, I designed and made limited edition mohair bears which I sold through a wonderful little shop on the Sunshine Coast - Bears On the Wharf. A couple of years down the designing track, I was asked to teach a bear making class at our local church craft group. The ladies were keen to make bears, but wary of making mistakes on the fairly expensive mohair. So ... I came up with the first of my designs to be made from a bath towel dyed with Parisian essence - Olive Bear. Since then the Tag Along Teddy family, or hug as a group of bears is called, has grown somewhat and now also includes sticheries, wall hangings, bags, cloth dolls and more. Many designs feature bears, though my imagination occassionally skips off in a different direction!